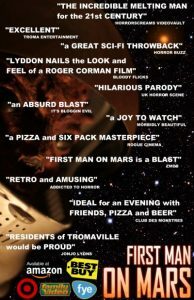 Tomcat Films release of Mike Lyddon’s latest feature film FIRST MAN ON MARS is available on DVD wherever satirical b-movie horror comedies are sold! You can pick up a copy today at TARGET, BEST BUY, AMAZON, FYE, BARNES AND NOBLE, FAMILY VIDEO and other fine retailers. HORROR BUZZ calls it a great sci-fi throwback and ROGUE CINEMA hails it as a pizza and six pack masterpiece. This entry was posted in cult films, horror comedy, indy dvds for sale, low budget films, Low Budget Horror Films, Low Budget Science Fiction Films, new horror dvds and tagged amazon, barnes and noble, best buy, First Man on Mars dvd, fye, Horror Buzz, Mike Lyddon, rogue cinema, target, trailer. Bookmark the permalink.